Reanimated and ready to rumble! The Rune Shark weapon was modelled specifically after these ancient kings of the sea. Nothing beats the original, even in skeletal form! Hydro mice beware, you're in for a scare! The Skeletal Rune Shark Skin can be used on the Rune Shark Trap. The trap's stats (power, power bonus, attraction bonus, etc.) are not changed. The Skeletal Rune Shark Skin may be made available during the annual Halloween event and can be traded on the Marketplace or through Give To Friends. 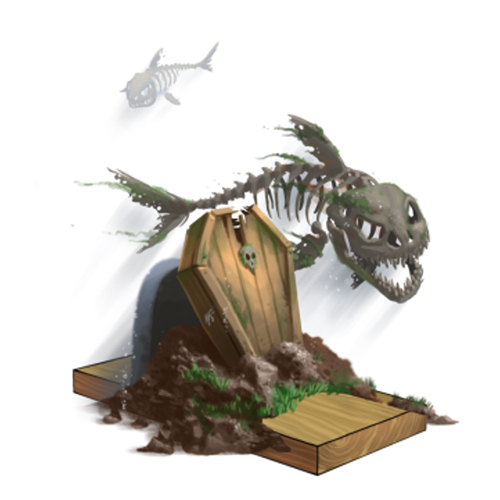 14 October 2014: The Skeletal Rune Shark Skin was introduced as part of the Halloween 2014 event. It could be purchased for 200,000 gold and 10 Cobwebs. This page was last edited on 9 December 2017, at 14:58.